If you snore, you are not alone. Statistics indicate that approximately 40% of adults over 40 snore at least some of the time. Snoring interrupts the restful quiet sleep which is so important to our and our bed partner’s good health. It can lead to daytime sleepiness and fatigue which can impact many aspects of an individual’s life. It can also have many health consequences. Snoring is associated with increased risk of hypertension as well as an increased risk of both cardiovascular and cerebrovascular disease. 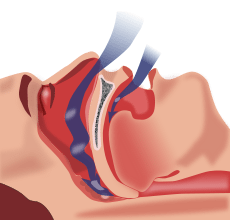 Snoring, even without apnea, can lead to numerous arousals. Arousals have been linked to sympathetic nervous system activation which may provide a causal link between snoring and hypertension Oral appliances (OA) that treat snoring, UARS, and OSA are devices worn in the mouth similar to sports mouth guards or orthodontic retainers. They are made of plastic and fit partially or completely within the mouth. Currently there are over 40 different types of oral appliances available. OA’s may be used alone or in combination with other means of treating sleep apnea, such as weight management, surgery and CPAP. There is no one particular appliance that will work for every patient. Any dentist supplying oral appliances must be familiar with several different types. Millions of people worldwide suffer diminished quality of life due to the effects of sleep- disordered breathing (snoring and obstructive sleep apnea). The worst cases can be life- threatening. Recently, the medical and dental professions have partnered to provide essential relief for many of those afflicted with this widespread malady. As medical sleep specialists reach out to include dentists on the “sleep team,” it is incumbent on the dental professional to have sufficient education and training. Presently, there are a multitude of opportunities and venues available to the dentist who may have an interest in this burgeoning new field. However, caution is required during the learning experience because different sources of educational material may not be congruent with legal or professional ethics.